The last bit of the holiday has been put away but before I move on to 2010 I had one final thought. 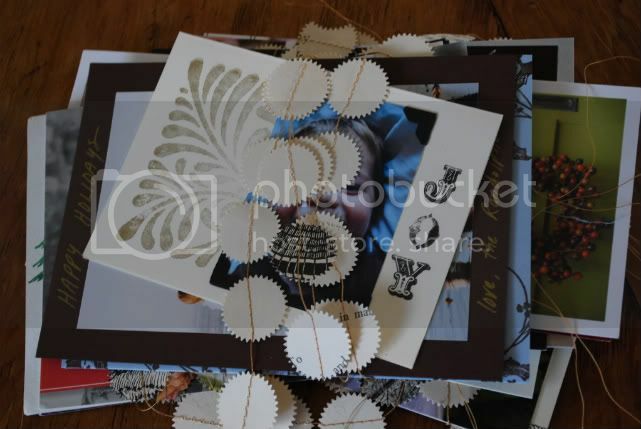 What do you do with all of those beautiful cards filled with well wishes and happy~growing families? Well this year I used them to wrap up all of my garland. It is kind of like a little gift I am packing away to revisit next December. hey! i know that little guy on the top of the pile... my little is loving the 'r' shirt you made and her auntie gifted. as soon as she lets me capture her in a photo while wearing it, i'll put up a post. i love your work! !